With the Cold War a fading memory, some nuclear powers have adopted strategies allowing for limited nuclear strikes. But a disturbing new study shows that even small batches of nukes can have disastrous environmental consequences on a global scale. In the 1980s, experts warned of a nuclear winter—a severe and protracted global cooling event triggered by an all-out nuclear war. A new study published in Environment Magazine warns that a scaled down version of a nuclear winter is still possible through the application of limited nuclear strikes, and that these so-called “nuclear autumns” could be caused by as few as five conventional nuclear bombs—and possibly even just one. The paper is a grim wakeup call for military planners who think small batches of nukes won’t result in severe environmental consequences. Back during the Cold War, with the globe basically divided into two hostile camps, our civilisation faced the threat of an all-out, Armageddon-inducing nuclear war between the United States and the Soviet Union. The prospect of Mutually Assured Destruction (MAD), it can be argued, prevented such a horrendous conflagration from transpiring. But we no longer live in a bipolar world, and some nuclear powers are starting to adopt tactical doctrines that allow for limited nuclear strikes and the first use of nuclear weapons. The Russians, for example, have said they’d use limited nukes to deter or end conventional wars. The US, perhaps bound by its NATO obligations, might decide to use limited nukes when defending an ally. Alternately, it could drop a bomb or two on a country following a biological or chemical attack, or as a way to bring a“rogue” state under control. 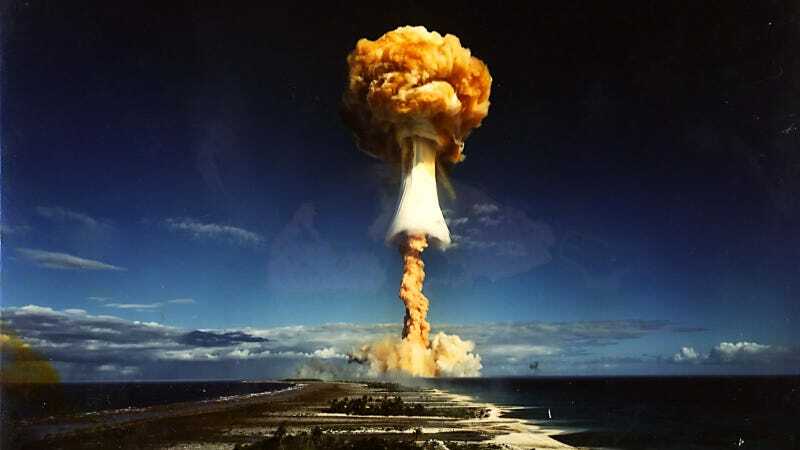 A weird sort of complacency appears to have settled in as regards the limited use of nukes, but Adam Liska and his colleagues from the University of Nebraska-Lincoln are hoping to crush any illusions we might have about these horrific weapons. As previous work has pointed out, the nuking of a sufficiently large city would be enough to generate a global-scale nuclear autumn. Take Los Angeles, for example, a city that extends for 500 square miles. The explosion and resulting fires would send an estimated 5.5 million tonnes of ash and soot into the stratosphere, causing sunlight, temperatures, and rainfall to temporarily decrease around the world. Globally, this would result in diminished growing seasons for the next half-decade, and temperatures would be the lowest in a thousand years. In some parts of the world, rainfall would be down by as much as 80 per cent. But unlike this earlier work, which focused on relatively small, 15-kilotonne nukes exploding over cities, the new study looked at whether today’s more powerful weapons could trigger nuclear autumn all on their own. They can. Liska and his colleagues found that the US, Russia, and China all have weapons that could trigger a nuclear autumn through the detonation of fewer than five bombs. This includes nuclear warheads placed atop air-dropped bombs, intercontinental ballistic missiles, and land-based missiles. Frighteningly, China—with its five megaton bombs—could cause a nuclear autumn with the launch of a single missile. “As long as conventional nuclear weapons are prevalent, the breadth of existing research indicates that the question is not whether a nuclear drought can occur, but what factors increase its probability of occurring and what actions can be taken to mitigate the potentially devastating global impacts,” conclude the authors in the study. This may be more than a depressing thought-exercise. With North Korea now apparently in the possession of intercontinental ballistic missiles, and with international relations steadily degrading among the various nation states of the world, the prospect of a country opting to use its nukes is only increasing.